Both Murphy and Blumenthal have presented themselves as the political poster children of the anti-gun movement ever since a shooter opened fire with an AR15 semi-automatic rifle on school children in Sandy Hook, Connecticut. Demagoguery, in this case, is pointless though, as ever, politically useful. The weapon used in Annapolis by Jarrod Ramos was a shotgun, the kind of allowable self-defense rifle former Vice President Joe Biden once recommended to frustrate mass murderers approaching from our driveways. Just before telling details began surfacing – the devil was in them – there was a short window of opportunity for free range speculation. For a moment there, it seemed as if a Trumpeter, armed perhaps with a “military styled weapon” had turned his anger upon a “fake news” paper. But, sadly for some, this was not the case, although an account in the Baltimore Sun does manage to smuggle into its primary coverage, a day after the shooting, a Trumpian reference: “The shooting, which came amid months of unrelenting verbal and online attacks on the ‘fake news media’ from politicians and others from President Donald Trump on down …” The Baltimore Sun and the Capital Gazette are sister publications. The shooter, a loner who found personal communication awkward but anonymous communication liberating -- where have we seen this before? -- was animated by vengeance. The rife he used was not a “military-style weapon,” but a commonplace shotgun. The place of attack was what has been called “a soft target.” And, not unimportant, the response time of police and others was a brief 60 seconds; it does not get much better than that. Also, first responders did not linger on the periphery tremulously waiting for reinforcements; they raced into the firing. Given all these givens, it becomes possible to ring from them some valuable lessons. Reporters and commentators -- always wary of being thought pedantic or, worse, moralistic -- call such lessons “takeaways.” But they are lessons containing invaluable bits of wisdom. 2) It may be nearly impossible to prevent mass shootings, but response time and other commonsense measures can mitigate disasters. 3) Soft targets – such as schools -- are hardened when the castle has a moat and the guards at the drawbridge are armed and dangerous to repel unwanted invaders. 4) It IS possible, in schools especially, to involve the whole mini-polis in preventative measures, which necessarily would involve predictive profiling. Israel does a splendid job in this regard, without compromising the moral strictures of students and faculty – Connecticut, not so much. Think for a moment before answering the following questions: Would high school classes in the proper use of sporting rifles help or hurt efforts to reduce school shootings? Would trained, armed security personnel in schools, along with mechanical and technological speed bumps to easy entry, reduce crucial response time in the case of school shootings? Would efforts among students to include in their social embrace students who are “loners” dull the edge of murderous rage? To what extent are good manners, enforced by enlightened discipline, social prophylactics? 5) Not everyone who cries “wolf! wolf!”, when there is no wolf – among politicians, almost always for political gain -- should receive our unexamined approval. 6) Finally, we all should reject tendentious arguments. 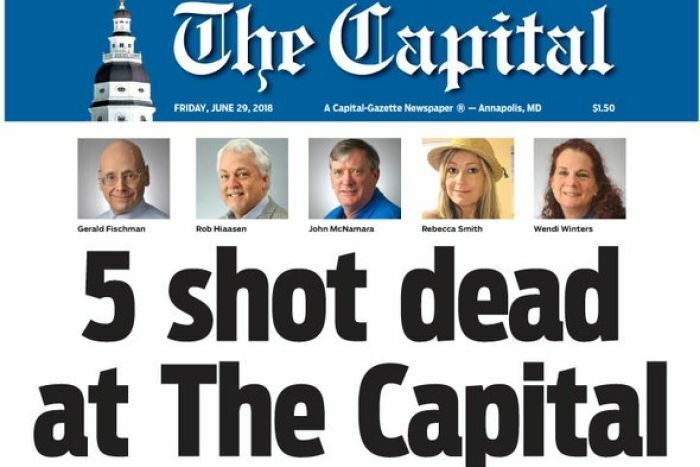 The notion that the assault on the Capital Gazette by a man nursing a private, score-settling, vengeful but deliberative motive is causally connected to Trump’s intemperate and generalized attack on the public media is a textbook illustration of the post hoc ergo propter hoc (“after this, therefore because of this”) fallacy. “The shooting came,” the Associated Press(AP) reported, “amid months of verbal and online attacks on the ‘fake news media’ from politicians and others from President Donald Trump on down." Because one action is framed in a newspaper account beside another action, there need not be a causal relation between the two. Such invidious planted axioms, we should all agree, do not point to a dispassionate and non-partisan search for the truth, which is what good journalism is all about.